Our curriculum is accepted in all 50 states and internationally. The BLS certification course is 100% online and all study materials are included with purchase. Take the exam on your schedule! The BLS curriculum has been redesigned to conform to the latest recommendations of the American Heart Association. 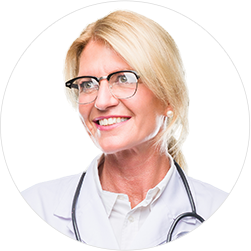 We guarantee the BLS Medical Training provider card will be accepted worldwide and offer a 60 day 100% money back guarantee. You will instantly receive a digital provider card after passing the exam to have on file while you wait for your hard copy provider card to arrive (2-5 business days). You will be able to review your exam results/missed questions so you can study those areas of the provider manual. You can take the exam as many times as needed until you pass. The Basic Life Support Course is designed for healthcare professionals and concerned citizens alike. BLS includes instructions for cardiopulmonary resuscitation (CPR) and the use of Automated External Defibrillators (AEDs). 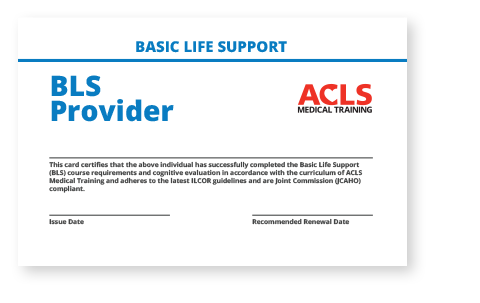 Unlike ACLS curriculum that is focused on adult patients and PALS, which is centered on infants and children, BLS includes treatment guidelines for infant, children, and adults. The materials also cover Relief of Choking, with interventions such as the Heimlich maneuver and back blows/chest thrusts. BLS certification is a basic requirement in most dental, medical, and surgical facilities. Initial BLS certification is valid for two years, and certification renewal is required every two years. There have been some rather dramatic changes to BLS algorithms recently, so if you have not recertified since 2010, you should consider renewing. What is the biggest hurdle facing a bystander who faces a life-threatening emergency? Are you afraid to deliver CPR? If you said ‘yes,’ sadly, you’re not alone. Seven out of 10 Americans do not feel prepared to deliver CPR. Two-thirds of cardiac arrests in young people are witnessed. If a bystander provides CPR, kids are over 3 times as likely to live as just calling EMS or 911. The same is true for adult victims—CPR doubles the chance that an adult in cardiac arrest will survive. Basic Life Support saves lives, but everyone needs to know how to do it. Being certified in BLS will help you feel confident to respond with High Quality CPR if that unfortunate time ever comes. 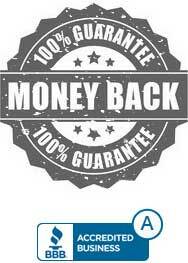 We guarantee your employer will accept the BLS Medical Training provider card. To date, we have a 98.7% acceptance rate. The BLS Medical Training courses are physician created, adhere to the latest AHA guidelines, and accredited for AMA PRA Category 1 Credits™. While unlikely, if the provider card is not accepted by your institution or facility, simply email us through the Contact Us page anytime within 60 days of purchase for a prompt and courteous refund of your entire course fee. The subject matter was excellent, very straight forward and helpful. Great way to recert from home or office.